I got the first laid-out copy of Dragon Heresy: The Book of Heroes from +Rob Muadib this week. We’re still working on it, though work will slow down a bit as he goes back to school. That’s not actually a big deal – technically, the layout comes last, after writing and editing and lots of other things. But I’ll tell you what – I’ve come to the conclusion that having a preliminary layout is all good, no bad. And I’ll tell you why. Actually, I’ll tell you why in another post. This one? This is about printing. Dragon Heresy is not just going to be a big book, it’s likely going to be two big books. While there’s editing and tightening that will and must be done, I’ve got rules, character generation (that’s over 100 pages), spell lists (that’s another 100 pages in SRD5.1 books), a full setting with “what’s it like to live there, and recent history” for each nation/realm, a sizeable list of magic items, and 100,000 words of monsters – likely 160 pages right there. SRD-based book that are complete are going to be big. Limited ways around that, because that engine rewards giant lists of things rather than the build-your-own metasystem approach of a HERO or a GURPS or Fate. But I digress. The layout plunked down on my desk at 370 pages. That will almost certainly compress, and Rob and I are working hard to make that so. But 370 pages means that a typical “perfect-bound” hardback is going to be fraught with peril, because the glue won’t necessarily keep the pages where they need to be. GURPS books had this problem early on – and SJG being SJG, they replaced every book that had that issue free of charge. I doubt I can afford to do that. But looking at Dracula Dossier and the Delta Green Agent’s Handbook that plunked down on my desk over the last year or so, I don’t have to – both have sewn bindings. That means when you open it up, there’s a flexible bit in the spine that allows it to remain intact and open fully. For a big book, this is both more customer-delighting and will probably save the publisher/RPG company money. If you have a going concern with plenty of cash flow from other products, you have more to think about. If, like me, you don’t – at least not yet – you probably can’t afford to play the odds that it all goes to plan. The jargon of the printing and binding industry is dense and technical. I won’t try and get it all correct, but documenting what I’ve learned might help someone. Perfect-bound books are glued into the cover. Many RPG books are made this way, as are many trade softback books. Grabbing the manual for Matlab and Simulink that is on my shelf, it’s a perfect-bound book. It will not lie flat when opened. You can also get lay-flat perfect-bound books, which still glue the pages in, but there are design elements present that allow the glued spine to fold more sharply. There seems to be some level of innovation (expected!) 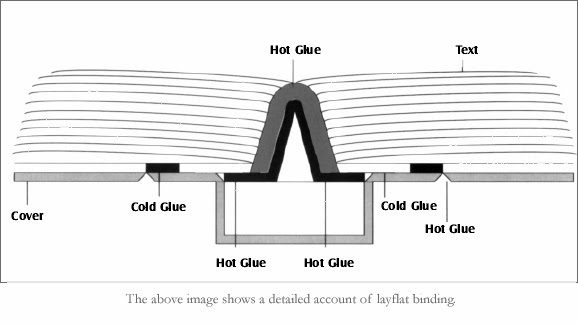 in the lay-flat technology in the form of adhesive selection. Polyurethanes (PUR-binding) are advertised to lay flat, stay flexible, and be up to 40% cheaper than smythe-binding, which I talk about below. Another option is the Otabind. This seems to be the technology described to the right as well. It uses selective glue application to allow the flexible glue-strip to lay flat, while the cover floats. One thing about glued technology is that I strongly suspect it’s page-count independent. If you want to have a 161-page book, you can. 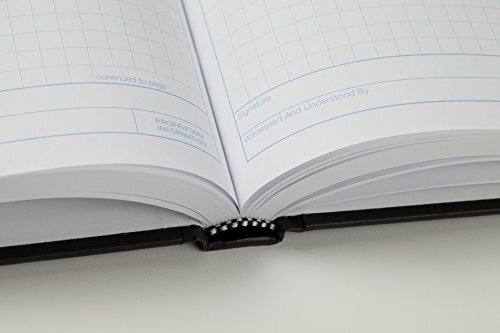 The next pieces of jargon revolve around sewn bindings. This is classic bookbinding technique, and involved printing pages on both sides of large sheet, folding them together into “signatures,” which are the folded sheets, which seem to be required to be 8- or even 16-page increments, due to folding. If you’re going this route, plan your layout ahead of time to meet this requirement for lowest cost. 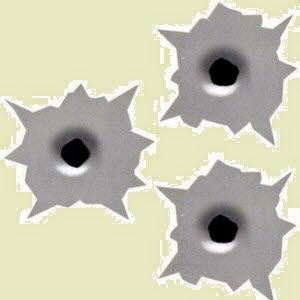 But there’s no question – it gets the job done, and is very attractive and durable. I believe that case-wrap and sewn binding are synonymous, but I’m not 100% on that. I won’t make you wait for it. 1,000 is the magic number, it would seem, for an offset print run. Fewer than that and the prices tend to go up, More and they can go down. Way down, in some cases. Many of these companies have online quote generators. But I’ll throw down what I’ve found. Let’s take a look at a 352-page book – a hefty one – with a standard hardcover with matte laminated print and matte (dull) pages, in 100% full color. The interior page weight will be between 70# and 85# paper – I’ve seen stated preference for both. One thing to find out first, and ask specifically: not all binders are printers, and not all printers are binders. What you want as a small-fry publisher like me is to send a company two files: a PDF of the cover, and a PDF of the interior pages. If you get a quote and it seems low, make sure you’ve asked this question! I got a call back from a vendor today that was asking me from where I was going to ship them hundreds or thousands of pounds of pre-printed spreads! Victoria Bindery/First Choice Books: Hardcover/Smyth Sewn. 370 pages printed full color, 50# text stock. Hardback, matte laminate cover. About $55 per book. Victoria Bindery/First Choice: Sent me soft cover perfect bound too. $37 per book. Lulu: US Letter hardcover casewrap. Full color, 352 pages, 1200 quantity. $61.42 per book. Drive Thru RPG: Hardcover, Standard Color Heavyweight, Large Size, 352 page. I think these are perfect-bound. $14.50 per book if you order 250 or more. Colorwise has a wonderful and comprehensive online quotation page. They quote up to three quantities. 352-page, case bound, 70# uncoated paper. $49.65 for 500 books, $33.14 for 1,000 (! ), and $22.08 for 2,000 books. Star Print Brokers goes for printing in Asia. They quoted me about $12.50 per book with my general specs, delivery of 1,000 books to my door in Minnesota. I didn’t give them enough detail for a precise quote, but I asked for: hard case, 370-ish pages, 1 color ink, printed cover. So this might be basically a monochome book, which will be less than color. Still – lowest price yet. Thomson-Shore thus far is my “wow, these guys are good” winner. They referred me to someone that had done RPG work before, guy named Bill Wearne. He said he’d just printed 1,000 copies of 400-page 8.5×11 full-color for $12.50 per book. Explicitly states that using color throughout the book is the highest cost; separating color into 16-page sections can get you big discounts. He then noted (based on my mail) that he’d used incfile to set up an LLC – so he went above and beyond to help me with my project. He noted explicitly that it’s a “email print-ready PDF, four weeks later get books.” He also sent me a ridiculously attractive “sell sheet” on how they support crowdfunding, including domestic and international shipping. New winner. Seriously. Bind Tech is a bindery, but the contact sent me names for local printers in Nashville. PixArt Printing seems to offer 1,000 copies of sewn-binding hardcover books at 352 sides (the first time I encountered this term) with 70# matte paper, full color for $6.72 per book. Seriously. Looks like 10-day delivery too. For these guys, an equivalent perfect-bound book is $17.62 per book, which seems to invert conventional wisdom. PrintNinja gets it done as requested for $15.46, but that includes about $3.25 per book for shipping -they recommend saving money here by making a deal with a freight-fowarder, which may be beyond the skill set desired for a person in their house. Still, the raw book cost is about $12 per book. I was dismayed at the cost of Lulu, and though perfect-bound books are how WotC delivers their product, I love the quality of Dracula Dossier and the new Agent’s Handbook both have sewn bindings, and it’s just a good feel. I don’t know what to make of PixArt. If their price for sewn binding is for real, it’s ridiculously good. For the rest, you’re looking, for a seriously good-quality book like what I’ve specified, at about $10-15 per book, which still leaves you out $10,000 or $15,000. But there’s a lot of room to offer a great book at a good price. 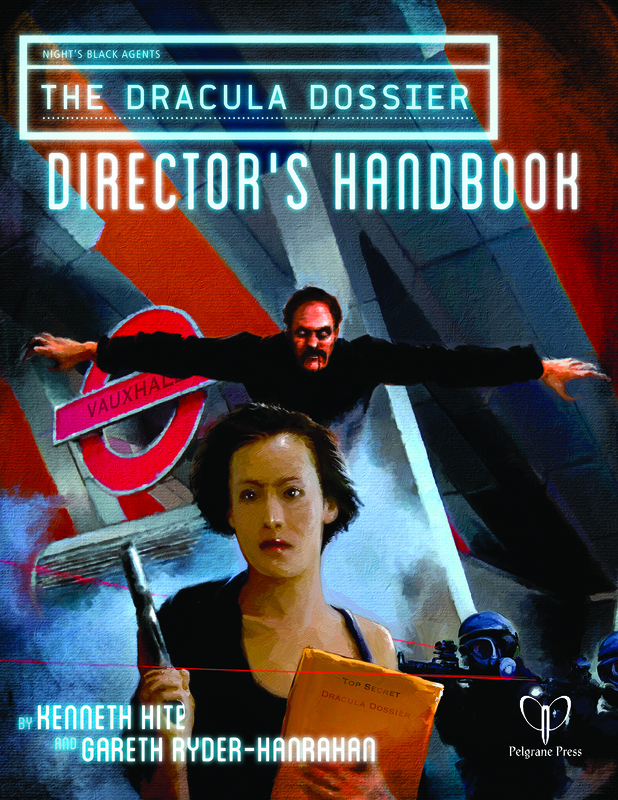 The Dracula Dossier, a 368-page book at least as good as what I got quoted for quality, sells for $50 (includes PDF) while the PDF sells for $25. With a $50 cover price and a $15 print-and-ship cost, you’ve got a lot of room to actually make a few bucks on your product. I’ve done a bit of “break it down” on what that means. Let’s say I do a super-limited Kickstarter, with one reward level ($50, for a hardback book). People sign up, and pledge enough to sell out a 2000-copy run for a full-color hardback. Woo-hoo, $100,000 is mine, right? No. Kickstarter fees are 8% + 0.20 per pledge – for me, notionally, that’s $8400. MN sales tax and local taxes will ding me for $7125. So, of that 100,000, I now have $59, 475. I have had to pay for maps, indexing, editing, and layout. Call that $10,000. Indexing is budgeted at $10 per 1,000 words. Editing can be 2.5-8 cents per word, and for reasons I figure on the low end. Call it $6000 for a 200,000-word book. Layout is maybe $1,000 per book, but that varies all over the place. Oh, and now art. Full-color art at one piece of art per three pages, and 1/3 page per piece, at $250 per full page of art? Another $10,000. Don’t forget – print the book is $30,000 at $15 per copy. Let’s presume that includes shipping to US customers. International? WAY more. I’ve seen rates as high as $30 per book. But even with domestic, your costs to edit, put art in, index, and print the thing are $50,000. Cash left to you? $9.475 (about 5 cents per word), out of which you still haven’t dealt with international shipping, setting up a website, marketing, legal fees or fees for making an LLC (and you DID do that, right? To protect your house from legal liability in case someone with a bone to pick sues you?). You need that kind of margin if you’re dealing with physical media like books. If you’re PDF only, well, the Pelgrane example suggests the price for the PDF goes down to half. Call it raising $50,000 instead of the full $100K. You still have to pay the $20,000 for what goes into the book. Taxes are halved to about $16K, and Kickstarter fees to about $4,000. So you still keep $10,000, and your per-word rate is about constant. So hardback and print aren’t that different using this model, and a lot of money goes away very, very quickly. Do your math. The thing for me there is that I would rather send the taxes in early and get a refund later as risk management. No accountant would agree with me – and they’re right – but by planning it my way “all your surprises will be pleasant ones.” I have followed this strategy with selling investments that are part of my work income (always paying 25% taxes right away) and it has provided an important cushion in the past. It’s a good point, though – if you assume a net 15% rate on the 35K profits, you’re out $5-6K in taxes, leaving $30K in profits. That’s an authorial pay rate of .15 per word, which is more in tune with being both a writer, early editor, project manager, art director, and Chief Everything officer. But your actual tax rate will depend on your other income. If you have a day job that is well compensated, you may wind up paying the top rate on all of your profits – maybe $10K total. If the publishing industry income is your only income, firstly I might question your sanity, but secondly, your next taxes will be lower. Also – this math is for one book at the $50 price point. Dragon Heresy will be two, at roughly the same point, so things will scale accordingly. It will also vary by what your reward levels are. But you can see where the cost of obtaining and shipping physical stuff plays merry hell with things – which is why offering free dice, free T-shirts, free tote bags, etc is a huge risk for the creator. I will definitely not be doing so – certainly not for my first time out!